Odisha man Jugal Kishor Pradhan, who returned home for a function, is worried about his wife and two children who are in Barcelona now. KENDRAPARA: Jugal Kishor Pradhan (54) of Mandapada village under Pattamundai block of the district is a worried man. Ever since the terrorist attack in Barcelona in Spain on Thursday, he is glued to the television set anxiously surfing the news channels. His heart pounds in fear and anxiety with every gory photos and footage shown as his wife and two children have been staying in Barcelona for the last 22 years. 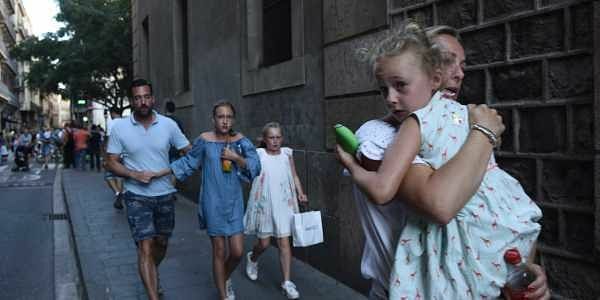 “I was shocked to know that a van plowed into pedestrians at Barcelona’s La Rambla tourist spot, killing 13 people and wounding more than 100. I became a bit relaxed on Friday morning after my wife, son and daughter spoke to me over phone. Though safe, they are living in fear after the terror attack,’’ Jugal said and added that he was thankful to God that his family was unhurt. Jugal returned from Spain to his riverside village of Mandapada two weeks back to attend a family function. "I reside in an apartment only 3 km from La Rambla which is a street in central Barcelona and a popular spot among tourists and locals. As thousands of tourists gather at the spot every evening, the terrorists carried out the dastardly act at the close of the day,’’ he said. Dukhishyam too worked as a plumber in New Delhi for almost four decades till the 1990s before coming back to Mandapada. His eldest son Jagannath is also working as a plumber in New Delhi. A large number of people from Pattamundai, Aul and Rajnagar blocks of the district attribute their prosperity to their expertise in plumbing. Around one lakh people of these areas work as plumbers in different States of the country and other parts of the world, especially the Middle East countries.